A handful of families have appeared on iQuote in the recent weeks, and in case you haven’t noticed them, here are the details. Three new families are available in iQuote; HP Elite 7500, HP Pro 3515 and HP Pro All-in-One 3520. 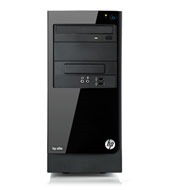 The HP Pro 3515 Microtower offers your business a fully loaded, space-efficient PC business PC with the heritage of HP quality and reliability. The new industrial design is slim, sleek and simply stunning with clean lines and a high-gloss black finish for a stunning modern PC architecture.